There’s nothing more frustrating than watching an impressive 35-m tall Radiata pine topple to the ground and then shatter into two or more pieces. That stem has now not only lost a chunk of its value, it has also become harder to get those fractured pieces back up to the landing or skid site, compared to a wholly intact tree. Unfortunately, this is a sight that is all too familiar in logging operations throughout New Zealand forests, with some estimates putting breakages as high as 75% – that’s three quarters of the crop. Amazingly, its accepted as normal practice by forest companies and contractors alike. But now something is being done about it. An old, yet simple idea is making a timely comeback and its set to play a significant role in the way our trees are felled, particularly on steep slopes. It’s a new take on the venerable fixed head feller-buncher. And interestingly, a bunch of Australians have been driving the trend in this part of the world. Hardly surprising. Fixed head feller-bunchers have been popular in ground-based Eucalyptus forests across the Tasman for many years, notably the US-style disc saw and shear head models that can cut and accumulate multiple stems and place them accurately and, most importantly, gently on the ground. This results in better bunching for the skidder and virtually no breakages. It didn’t take long for astute Aussies to figure that pine trees could be felled in a similar fashion. But disc saws don’t work so well with large diameter pine, which led to fixed head chainsaw models being developed and becoming mandatory in some Australian forests, particularly those under the management of HVP Plantations in the state of Victoria. 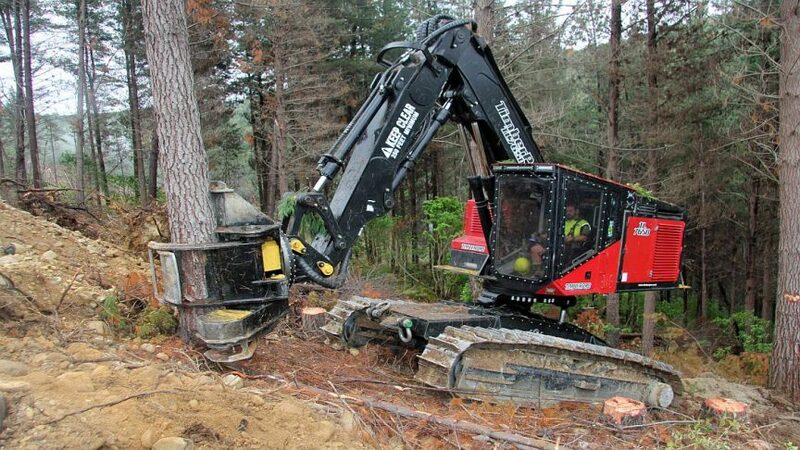 Two Nelson based harvesting contractors, Nathan Taylor and Hamish Matthews, working with Ian Wilson, have put a fixed felling head with lateral rotation onto a new levelling felling machine for their Nelson operation – the first of its type in New Zealand. They have discovered just what a huge difference this style of machine can make to minimising felling breakages and improving the way they extract trees on steep terrain. The full story on the adoption of this felling system and advantages to their operation can be read in the March 2019 issue of NZ Logger. Nathan Taylor from Mechanised Cable Harvesting and one of the early adopters in Australia, Andrew Mahnken from Mountain Logging in Gippsland, Victoria who had discovered the benefits of using fixed felling heads to harvest full stems long ago, will both be presenting as part of the HarvestTECH 2019 event being run in Rotorua, New Zealand on 26-27 June.